The naira yesterday appreciated to N360.55 per dollar in the Investors and Exporters (I&E) window even as the Central Bank of Nigeria (CBN) injected N210 million into the inter-bank foreign exchange market. A statement by the apex bank’s spokesman, Mr. Isaac Okorafor reiterated the CBN’s commitment to continue to boost interbank foreign exchange market to ensure liquidity and stability in the market. 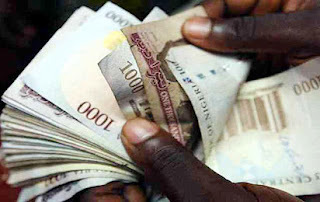 Data from FMDQ showed that the indicative exchange rate for the I&E window dropped to N360.55 per dollar from N360.68 per dollar on Monday, translating to 13 kobo appreciation for the naira.